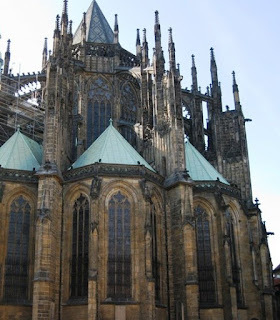 First I toured the Prague Castle, the best part of which was St. Vitas Cathedral. I did the audio tour and roamed around inside for a long, long time. Construction was begun on the cathedral in 1344 and not completed until 1929. Actually, there was construction going on while I was there, too. You can see scaffolding in the top left corner of this photo. 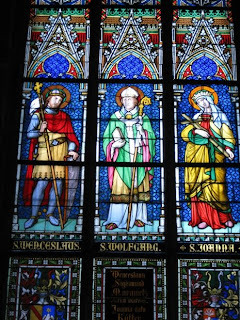 The Cathedral houses the tombs of many saints and three Kings. In the main sanctuary, all along the outside wall, circling the inner pews, are small rooms sectioned off and dedicated to a saint or king. Each side section also has elaborate stained glass windows. 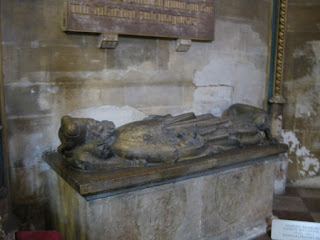 Here is an example of the tombs. This is a view of the exterior of the Royal Palace. 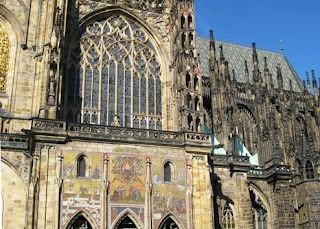 You can see the two St. Vitus spires behind. The palace grounds cover 18 acres and could take a whole day to visit. The palace buildings were quite plain looking, but the most unusual feature of this palace was the Main Hall. It was used for jousting. The staircases were designed for horses & a fully mounted soldiers to use. 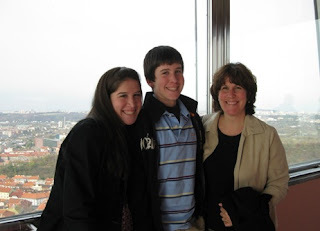 A really interesting part of my trip to Europe was meeting up with the Hood family in Prague. I went to high school with Richard and Alyssa & we have kept in touch periodically since then. 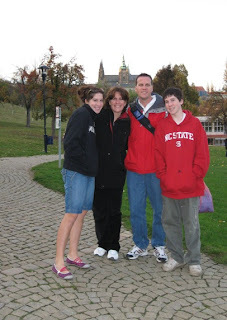 They were missionaries in Hungary for awhile, then back at Word of Life in NY, now in Prague. I previously contacted Alyssa and asked what I could bring them from the US. 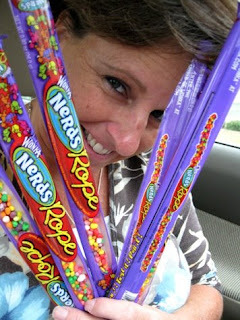 She suggested chocolate chips, cheezits, then she said, "Oh, lots of nerd ropes for Travis." Sure thing. Well, I couldn't find nerd ropes. I loaded everything else for them in my suitcase and headed to the airport. I wasn't feeling well, so I stopped at a drug store for cold medicine and there by the counter..... nerd ropes! I bought every last one of them. It was so great to meet up with them and catch up on old times. We spent Saturday afternoon and evening together & Sunday we went to church and dinner with them. So we went to a restaurant on the top of the "communciations" monument. Awesome restaurant, excellent food, but please. 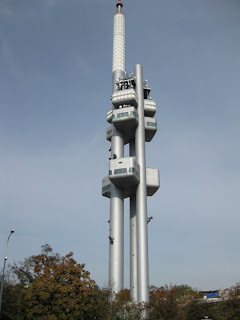 This is a TV tower that encompasses TV, FM and mobile communications. 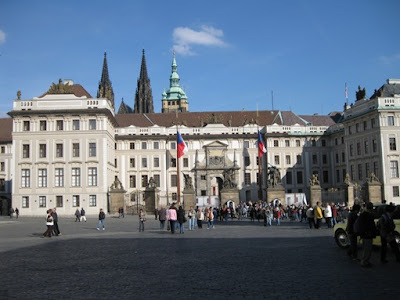 It is the tallest building in Prague. It was started in 1985 and finished in 1992. Yes, that means.... this gem of a building . . .
. . . is a communist work of art. "People were outraged by such an eyesore, but back then nobody had a right to complain," says Kamdine Khosrowkhavar. He (and the Hoods) swear up and down that these are babies crawling up the building, "slightly creepy babies" according to Khosrowkhavar, but, let me tell you, I've been there, I've seen them, these aren't babies, these are aliens. And it's a communications tower, get it?? They are trying to communicate with the aliens. Duh. Even I can see that. But please. 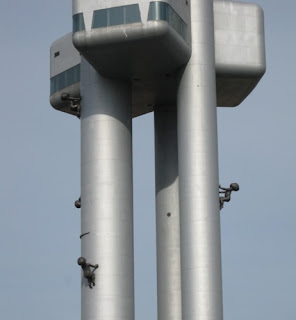 Why would they put creepy babies crawling up Prague's tallest building? And then they all go around stomping their feet and saying "No, they're babies!!!" What's the big deal? I'd be proud to be reaching out to other universes and stuff. You know, like the guy in Bowman, SC, and his UFO welcome center. It takes some really advanced scientific minds to reach out like this & I'm all over it. OK, so I know, my observant reader, you are wondering.... "...but where is Richard Hood in these photos? Didn't you take Rich to the communications tower?" 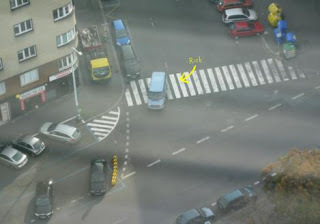 That's him in the blue van, in a circle pattern, looking for a parking spot. We got a kick out of watching him go round and round and round. 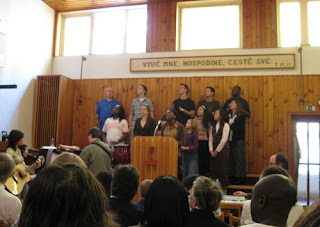 We attended the International Baptist Church of Prague. It appears they have a Czech service downstairs & an international English speaking service upstairs. They might even have a Spanish speaking service going on, too. It is such an awesome experience, as we travel, to go to local churches and feel like we are home. I love worshipping with other people of other churches, having one spirit, it always leaves me in awe. Prague is a wild city, a party city. I heard the bars and nightlife stays open all night long and people from all over Europe fly in the party all night, then fly out the next morning. The filth, the smell, the ads, the crowds testify this is probably true. But then to attend church and see a flicker of Light in a world of darkness -- wow -- what an encouragement, as well as a humbling experience. Let me encourage you to attend local churches when you travel, what a blessing. Thank you for your reply and your patience with my humor. I still have not corrected my spelling but I will get to it. I hope I get a chance to return some day.